After you state your hypothesis, you are ready to design an experiment to test it. You know that your experiment will involve counting how many times crickets chirp when the air temperature is high. But how will you know how many times the crickets would chirp at a lower temperature? You would need to include other crickets in your experiment for comparison. To test your hypothesis, then, you will need to observe crickets at different air temperatures. All other variables, or factors that can change in an experiment, must be exactly the same. Other variables include the kind of crickets, the type of container you test them in, and the type of thermometer. By keeping all of these variables the same, you will know that any difference in cricket chirping must be due to temperature alone. The one variable that is purposely changed to test a hypothesis is called the manipulated variable (also called the independent variable). In your cricket experiment, the manipulated variable is the air temperature. 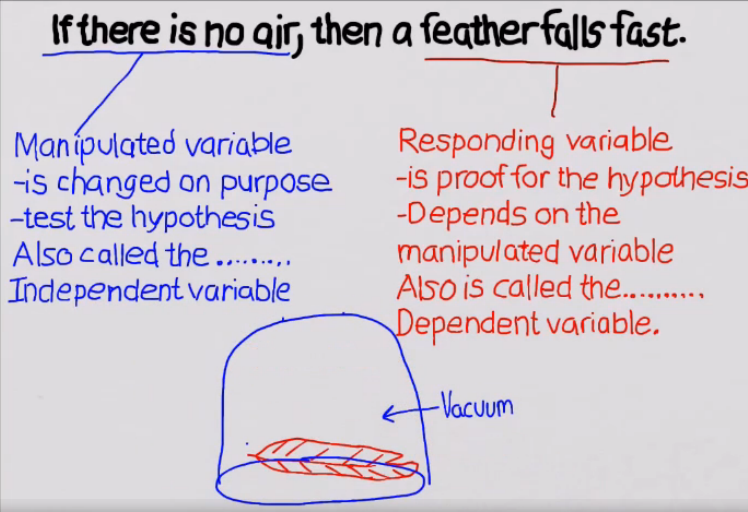 The factor that may change in response to the manipulated variable is called the responding variable (also called the dependent variable). The responding variable here is the number of cricket chirps. An experiment in which only one variable is manipulated at a time is called a controlled experiment.Figure 9 shows one way to set up a controlled experiment to test your cricket hypothesis. Notice that identical containers, thermometers, leaves, and crickets are used in each setup. In one container, the temperature will be maintained at 15°C. In the other two containers, the temperatures will be kept at 20°C and 25°C. Suppose you decide to test the crickets at 15°C in the morning and the crickets at 20°C and 25°C in the afternoon. Is this a controlled experiment? The answer is no. Your experiment would have two variables—temperature and time of day. Would increased chirping be due to the temperature difference? Or are crickets more active at certain times of day? There would be no way to know which variable explained your results.